Last year the American tradition of Christmas Eve boxes hit the UK in a huge way. With thousands of children getting one for the first time. Family and friends where doing this for their children, however I felt D was too young to actually benefit from a box as he was only 9 months old. I do love the tradition and the magic surrounding it. Many people tell their children that their boxes are delivered by the Christmas fairy for them to get ready for Santa. I think this is wonderful way to add some extra magic to Christmas Eve. 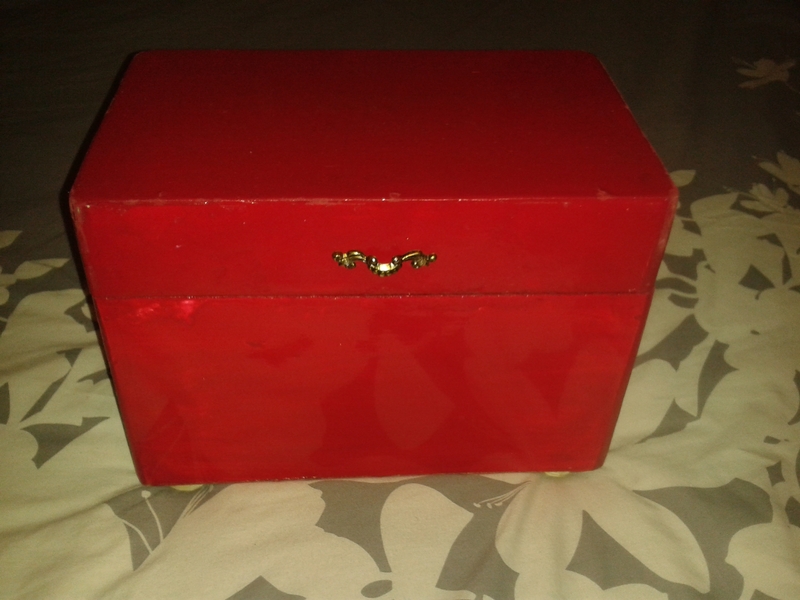 Our Christmas box is incredibly special for D. It has been handmade for him by his uncle (Who is rather ill) and has been painted ready for him to decorate with some of the contents. 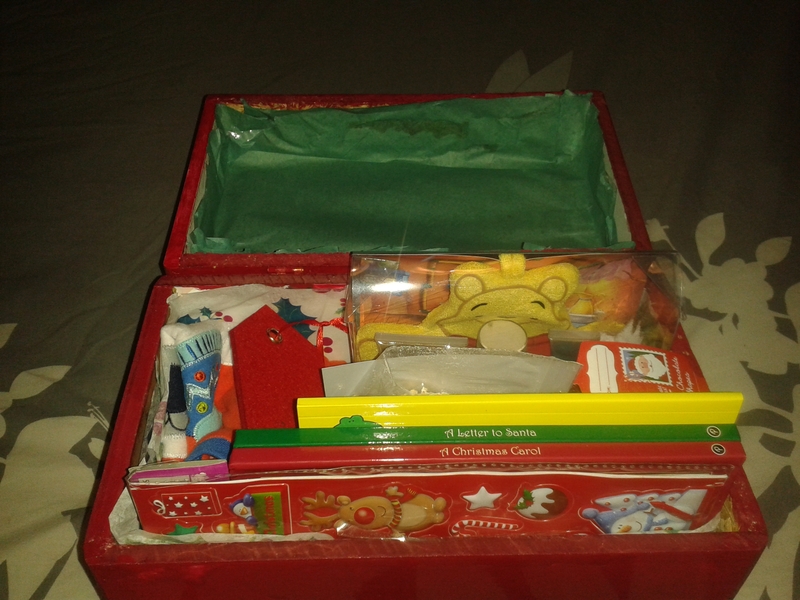 I hope this box will be treasured every year at Christmas and will grow to hold lovely memories for D. Here is our box below. I have added tissue paper to the inside to protect the box from scrapes etc. There is also a small winnie the pooh bath set. 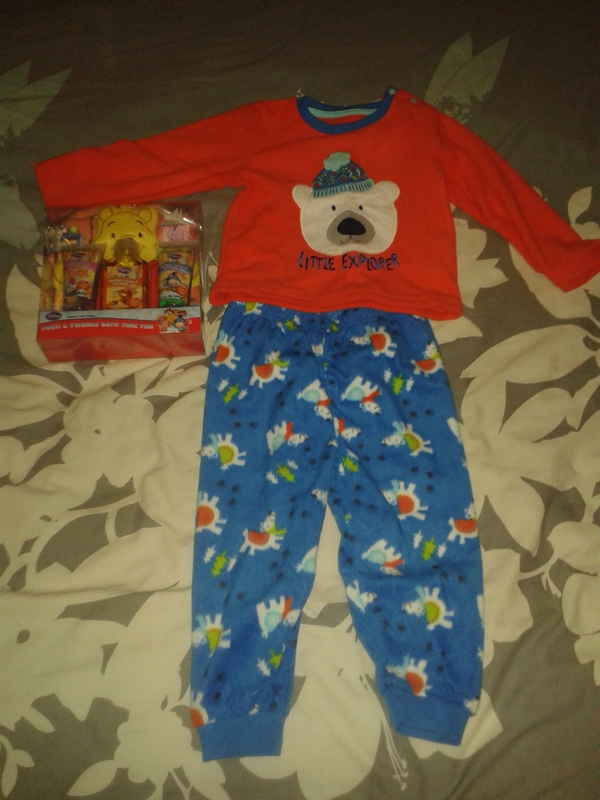 This was bought about 6 weeks ago when we went to the chemist to get nappies and D had a huge tantrum because we wouldn't buy it. He refised to leave the shop. Once we got home it was forgotten. So I put it away for his box! There is also two story books (I forgot I bought one) the first is A Christmas Carol, this is a personal favourite of mine and I can't wait to share it with D for the first time. This box will be read as a family when we first get D's box later today. The other book is A letter to Santa. I thought this would be the perfect book to read before bedtime to help give us that extra bit of magic and excitement. 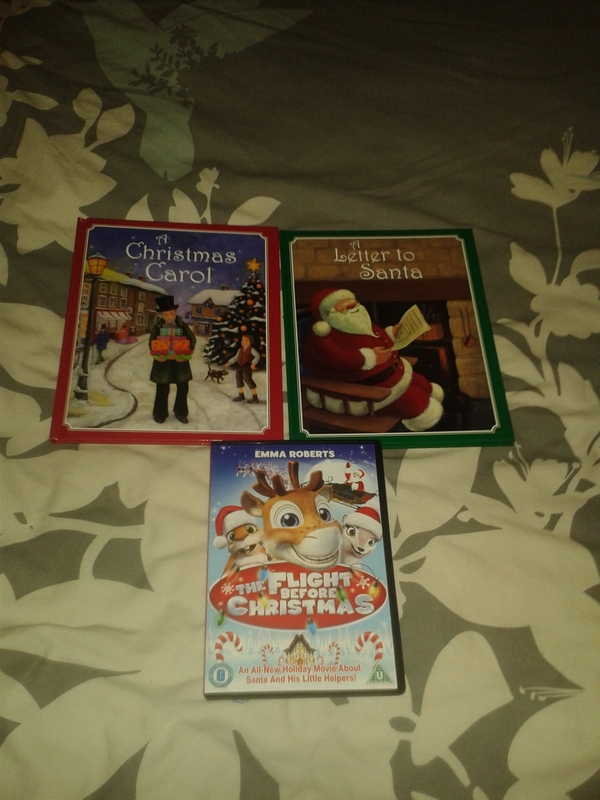 We also have a DVD called The Flight Before Christmas. I have never seen this one before so we can all sit up and watch this together as D loves animated films! Next we have a bag of chocolate coins and a bag of chocolate Santa's. These are to watch the film with and I also have some popcorn too. 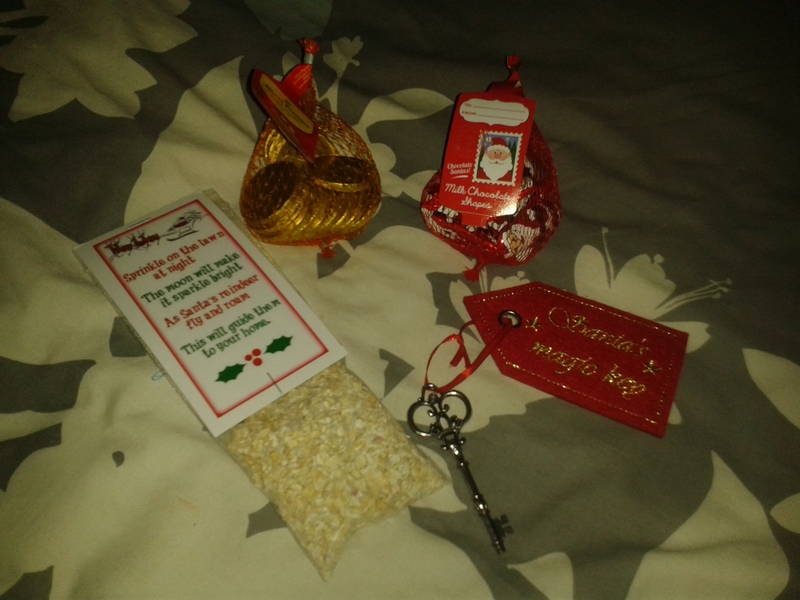 D has then got his Santa's magic key to go along with his reindeer food (which is just poridage oats and glitter in a bag) to sprinkle on the grass so the reindeer know where to go! 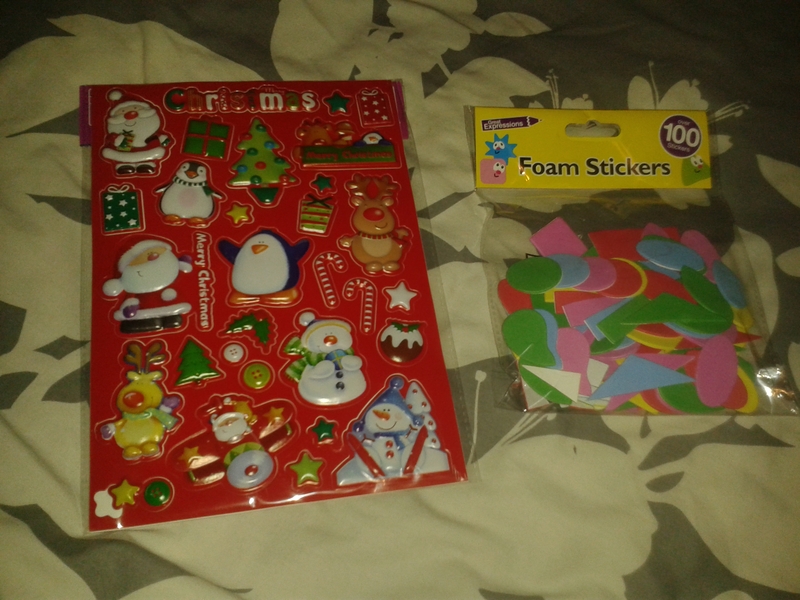 To decorate our box we have some Christmas themed 3D stickers and some foam shapes so he can put them on where he wants. 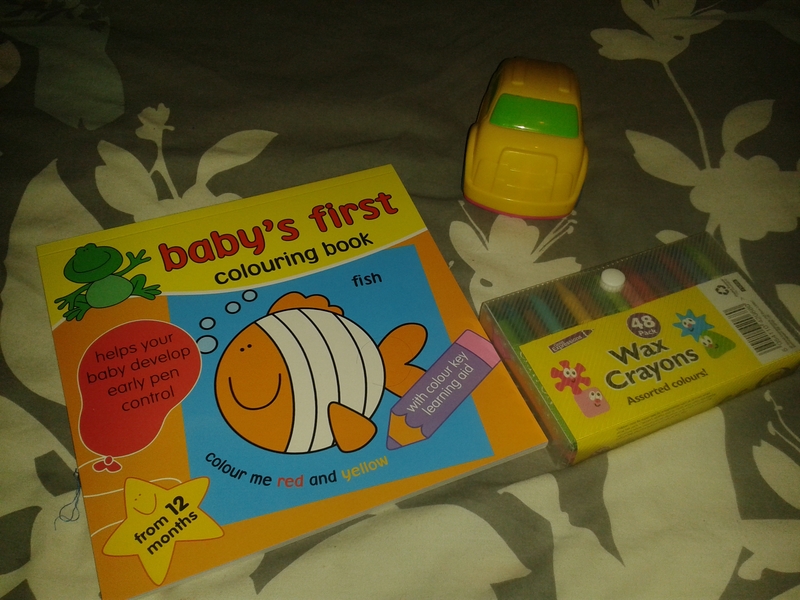 Finally D has a colouring book that is suited for children his age with each all filled in except for one colour. I personally thought this is a brilliant idea to teach toddlers where the colours go! Plus some crayons to colour them in. We have put in a little car for D to play with while we are finishing up with the tidying. I must say I didn't realise there was so much until I took it all out again. I have one last thing to ask, We are baking gingerbread for Santa and putting a few on the Christmas tree. Do you think Santa should be sneaky and half eat one from the tree? Let me know in the comments below what you think he should do! Well I hope we have lots of fun doing all the things in the box with D and I also want to wish everyone a very happy, healthy Merry Christmas!